Legendary jockey John Longden once said of Santa Anita Park, “It’s the most beautiful place you can find. You’re camping out when you leave Santa Anita”. The late rider, who won 932 races during 26 meets at the Arcadia, California track, would still marvel at the breath-taking beauty of a clear winter day at the track located at the base of the San Gabriel Mountains. Longden was an integral part of the most memorable moment in Santa Anita history as voted in a media poll. He guided George Royal to an emotional repeat victory by a nose in the 1966 San Juan Capistrano Handicap in his farewell ride, leaving onlookers shaking and misty-eyed. Longden retired with 6,032 career victories, a record that stood until passed in 1970 by Bill Shoemaker, who concluded another legendary career at Santa Anita on February 3, 1990, in the highly publicized “Legend’s Last Ride”. Change and tradition create a unique relationship, and the history of Santa Anita has been rich in both. There have been a lot of changes at Santa Anita in recent years. The Strub family ran the track for more than 50 years following its inception in 1934, but it became part of the Magna Entertainment Corporation empire when it was purchased in 1998 by Frank Stronach. In 2007, Santa Anita replaced its main dirt track with a synthetic surface called Cushion Track as part of a state mandate to improve safety for horses. Santa Anita has its traditional December 26th opening date, and continues through April 20th, where it has hosted the Breeders’ Cup World Championships. Even men of such vision as Elias Jackson “Lucky” Baldwin and Dr. Charles “Doc” Strub could not have imagined some of the events that would happen at “The Great Race Place”. Baldwin, who acquired Rancho Santa Anita, encompassing much of the San Gabriel Valley northeast of Los Angeles in 1875, opened the original Santa Anita Park on Thanksgiving Day, in 1907, but it passed into history following his death in 1909. 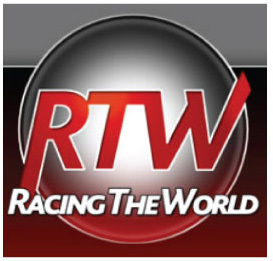 Racing also died in California until the passage of a bill to legalize pari-mutuel wagering in 1933. Doc Strub, a San Francisco dentist, spearheaded the formation of the Los Angeles Turf Club, which purchased part of Baldwin’s old one. A new era was launched when the track opened on Christmas Day, 1934. 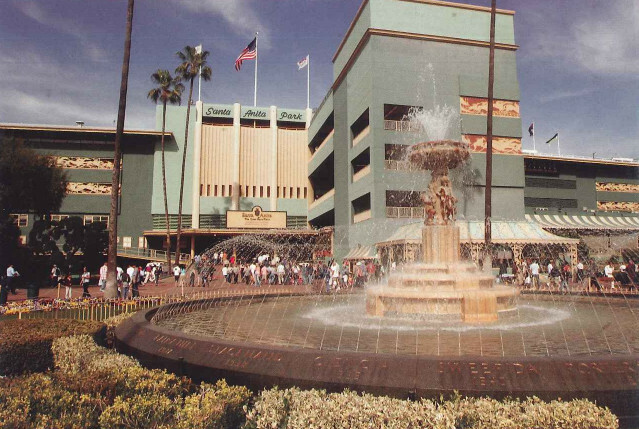 Santa Anita has hosted many of the greatest horses, horsemen and jockeys in the sport. Its beauty warned the track a prize for architecture at the 1937 Paris Exposition. Much of the Universal Studio hit, the 2003 film “Seabiscuit”, was shot at Santa Anita, which featured the beloved horse that won the 1940 Santa Anita Handicap in his third try. A life-sized bronze statue of Seabiscuit graces the walking ring. Santa Anita was also in the international spotlight during the 1984 Olympic Games in Los Angeles as the host of nine days of equestrian competition. The track averaged crowds of 25,795. Santa Anita again offered an international flavor as the October Breeders’ Cup host in 2008, 2003, 1993, and 1986. The Oak Tree Racing Association, which leases dates from the Los Angeles Turf Club for its annual month-long autumn meet, began in 1969. It has its own board of directors, but uses LATC management. Its lease has been extended through to this year. Oak Tree is a not-for-profit, non-dividend paying association, dedicated to channeling its profits into worthy industry projects. Grants have included more than $4.5 million to the University of California at Davis. Santa Anita set lofty standards during the Strub era. Doc Strub died in 1958 and passed the baton to his son Robert, who carried on the family leadership until his death in 1993.